Former state Senate president Stanley Rosenberg (left) and estranged husband Bryon Hefner. Squires-Lee had allowed a motion to initially impound the name of the plaintiff when the case was filed in mid-June. The order was then extended until July 11, the next court date in the case. The allegations and dates detailed in the lawsuit are identical to those involving one of the men who prosecutors say Hefner repeatedly groped. Tracy A. Miner, Hefner’s attorney, said in a separate filing that the man has already spoken to two Boston Globe reporters and at least two others. “[The] plaintiff’s willingness to disclose his allegations to the media and other[s] belies his contention that proceeding anonymously is in his best interest,” Miner wrote. Mitchell Garabedian, the plaintiff’s attorney, said Friday he had to limit his comments, given the ongoing criminal case against Hefner. “My client is courageous in coming forward, speaking out and filing a lawsuit with regard to this matter,” Garabedian said. Squires-Lee declined to comment through a spokeswoman about why she stepped down from the case. Jennifer Donahue, a Trial Court spokeswoman, said judges typically don’t state their reasons for recusal. The civil lawsuit is scheduled to return to Suffolk Superior Court with Judge Robert N. Tochka presiding. 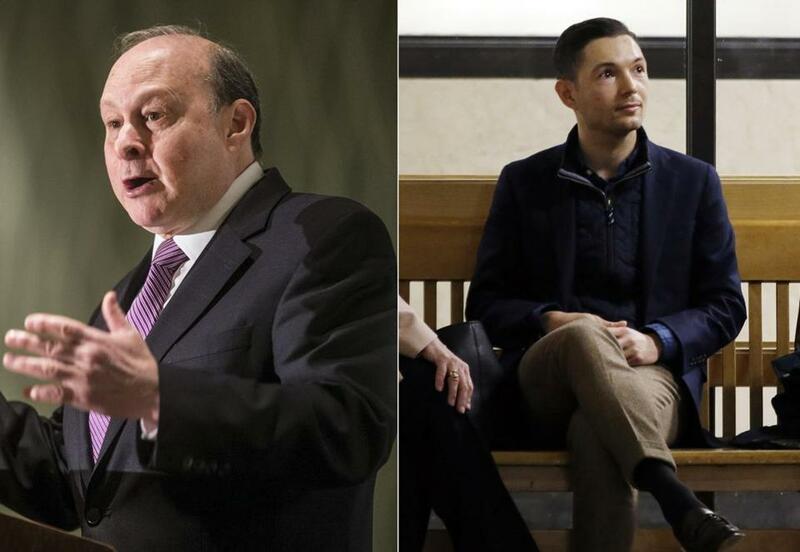 The lawsuit accuses Rosenberg of making “excuses” for Hefner’s conduct and “equipping defendant Hefner with the tools to act as an actual agent for” the Amherst Democrat. As a result, it was Rosenberg who subjected the plaintiff, and others, to Hefner even though he “knew or was aware that defendant Hefner posed a substantial risk of serious harm,” the 16-page complaint charges. The plaintiff said he did not report Hefner because he feared Rosenberg would retaliate against him.